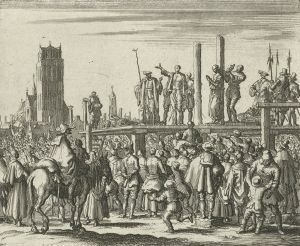 Execution of Jan Woutersz van Kuyk and Adriaentje Jans of Molenaarsgraaf, Dordrecht, 1572. Engraving by Jan Luiken in Martyrs' Mirror, v. 2, p. 567 of Dutch edition. Adriaenken Jansdochter, an Anabaptist martyr, lived at Molenaarsgraaf, near Dordrecht in the Dutch province of South Holland. She was imprisoned in the Vuylpoort in Dordrecht, and died on 28 March 1572, after being strangled and then burned, along with Jan Woutersz. When Adriaenken learned about her death sentence she thanked God that she was found worthy to offer up her body to God. Her mouth having been stopped with a wooden plug, she could not speak to the bystanders at her execution, among whom were some fellow believers. The Martyrs' Mirror includes a letter that Adriaenken wrote in prison to her husband, J. A. van Dort, as well as his reply written 18 or 19 January 1572. In this letter her husband encourages her to stand true and persevere in her faith. There is also a song concerning Adriaenken and Jan Woutersz which begins: "Uut de woestyn roepen wy Heer tot dy, Die ons in alle noot staet by" (From the wilderness we cry to Thee, O Lord, Who in every need art near). Braght, Thieleman J. van. Het Bloedigh Tooneel of Martelaers Spiegel der Doops-gesinde of Weereloose Christenen, Die om 't getuygenis van Jesus haren Salighmaker geleden hebben ende gedood zijn van Christi tijd of tot desen tijd toe. Den Tweeden Druk. Amsterdam: Hieronymus Sweerts, 1685: Part II, 566-569. Braght, Thieleman J. van. The Bloody Theatre or Martyrs' Mirror of the Defenseless Christians Who Baptized Only upon Confession of Faith and Who Suffered and Died for the Testimony of Jesus Their Saviour . . . to the Year A.D. 1660. Scottdale, PA: Herald Press, 1951: 897-900. Available online at: http://www.homecomers.org/mirror/contents.htm. Zijpp, Nanne van der. "Adriaenken Jansdochter (d. 1572)." Global Anabaptist Mennonite Encyclopedia Online. 1955. Web. 21 Apr 2019. http://gameo.org/index.php?title=Adriaenken_Jansdochter_(d._1572)&oldid=146350. Zijpp, Nanne van der. (1955). Adriaenken Jansdochter (d. 1572). Global Anabaptist Mennonite Encyclopedia Online. Retrieved 21 April 2019, from http://gameo.org/index.php?title=Adriaenken_Jansdochter_(d._1572)&oldid=146350.